Christmas Island lies in the Indian Ocean 1300 kilometres from Singapore and 1400 km from the Australian mainland. Rising from great depths the mountain reaches 360 metres above sea level. From first settlement in 1888, the mining of marine phosphate deposits has been the main industry of the island. This left denuded areas of limestone pinnacles and the openings gave the wind access to the remaining rainforest. In 1987 mining ceased and the Commonwealth Government announced that no more rainforest would be cleared. A worker-owned company commenced reworking the old mining areas in 1990 with rehabilitation a stated objective. The government also commits one-third of royalties to the rehabilitation effort. The company uses bulldozers to flatten the limestone pinnacles and soil is returned from nearby stockpiles to a depth of at least a metre. At Drumsite the Australian Nature Conservation Agency runs a nursery which should produce just over 50,000 trees for the rehabilitation plantings. A range of pioneer species is planted along with a few of the target species. The use of the exotic Muntingia calabura, strawberry tree, in an area beside the National Park raised some eyebrows but it does not germinate in even partial shade. Pigeons feeding on the fruit void seeds from the forest, assisting in recruitment. The reduction of wind turbulence on the plateau is important in maintaining the world's only nesting area for Abbotts Booby. These birds take 15 to 18 months to raise their single chick. The nursery has a problem Nigel does not have to face: crabs! Hundreds of them. 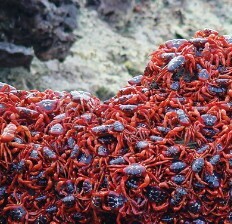 The Red Crabs for which Christmas Island is famous are the vacuum cleaners of the forest. All seed and seedlings have to be kept away from their hearty appetites and the little blighters can climb. Plantings are carried out by the company and ANCA with some help from school children. Those involved would love to have a group of volunteers like TREAT to boost their three full-time employees and occasional casual labour. The work is bringing its rewards as the trees grow quickly and the animals are moving in.